Is it another membership card to stick in your wallet? Like a membership to the gym, Costco, or AAA? You don’t get a special parking space or reserved seating, but you do get to experience life the way God intended. God designed His people to live in community. Committing to be a part of a local church body is part of that design. We’re a family: people who are committed to sticking together through thick and thin (Matthew 12:46-50). We’re a body: each member is contributing to the function of the whole, and we are dependent on each other (1 Corinthians 12:12-27). We’re instructed to respect the authority of the elders (Hebrews 13:17) and exercise church discipline (Matthew 18:15-17). We’re called to live out the ‘one another’ passages: there are over 60 verses in the New Testament about how we are to treat one another within the family of believers... things like loving one another (John 13:35), serving one another (Galatians 5:13), and forgiving one another (Colossians 3:13). 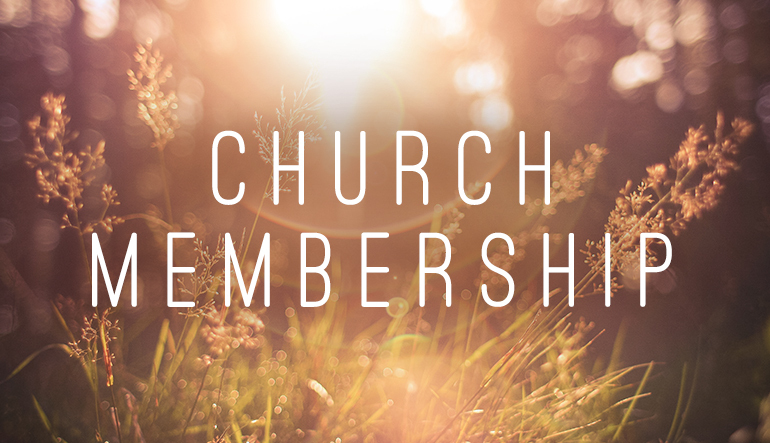 Membership is a way to formally commit to living out the Christian life with a specific group of people... the church. To be a Christian means being committed to a community of other believers and working together to reach our world with the hope that is found only in Jesus. Being committed to a community means we’re committed to one another, committed to sticking out the ups and downs of life with each other, and committed to working together towards the common purpose of reaching our world with the good news of Jesus. Admit that you have sinned against God and need His forgiveness once and for all. Believe that Jesus Christ, God’s Son, died for you as payment for your sin and rose from the dead to give you eternal life in heaven. Now, you may receive God’s forgiveness by personally trusting in Jesus alone as your only means of being cleansed from sin. Now, walk in newness of life (Romans 6:4). You don’t have to be baptized at Calvary. All we ask is that after having placed your trust in Christ for salvation, that you followed the example set in Scripture of publicly confessing your faith through the act of water baptism. We typically have opportunities to be baptized at Calvary in May, August, and November. This is designed for you to learn more about Calvary before committing to become a member. We’ll talk about how God designed His church to function, the history and beliefs of Calvary, and will go on a behind-the-scenes tour to learn about the different ministries that take place at our church. This is offered several times throughout the year, most often on Sunday afternoons. This is our chance to get to know you a little bit! You’ll sit down with one of our elders and get to share your story of how you came to know Christ, and have a chance to ask them any questions you have about the church. It’s also a great way to get to know one of the elders here at church!